Happy with these as dining chairs, specifically love the square back but with rounded edges - a subtle but unique look! WOW!! AMAZING!! LOVE MY NEW CHAIRS!! Distressed look and black metal legs works beautifully in an industrial contemporary setting. 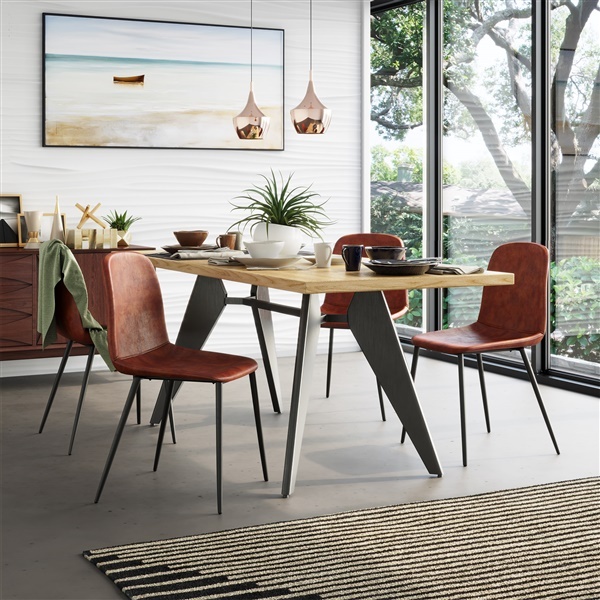 Most industrial design I come across has a lot of hardware and wood / metal combinations, I wanted something a little cozier and comfortable for my dining room and these were the ticket! I highly suggest requesting color samples before ordering this chair. I ordered in cognac and the color looks different depending on lighting in the room and being that the upholstery pattern isn't one solid color it varies in person. A solution was changing the lighting in my dining room to dimmer lights with a more yellow hue but it did create some extra work on my end. It's easy to request them I found out after the fact. Comfortable and smooth fabric!! Color choice was key to the design of my dining room! Thrilled! Amazing chairs!! So happy I ordered from here again! Everything is always GREAT quality and beautifully made! loved the color selection, but made my choice!! Vintage cognac upholstery is such an excellent choice, loved the selection of color options they offered it was hard to decide on one since they would all look awesome with my homes interior - incredible! LOVE THE DETAILED STITCHING! Such a great look and price was on point! Couldn't believe how affordable and high quality these were when they arrived! The padding on the seat cushions is excellent! Thank you! Brown tobacco upholstery matches amazingly well with my interior! Extremely happy my order! I'm absolutely obsessed with these chairs. There aren't enough words to explain both the comfort and the look. The distressed vintage look is awesome and they seem to be made really well. My moms favorite recent purchase!!!! Overjoyed to have purchased this product for my smaller table located in my office at work. Matches my desk chair and definitely added some flavor to my work environments decor. ProsComfortable. Supports posture. Warm presence. I've been a fan of Inmod for a few years now and saw that this chair was newer. I had been thinking of getting something similar but plastic. Boy am I glad I waited. It's the same shape but padded and upholstered. ProsComfortable and I LOVE the vintage look. Is this the price for one chair? Or a pair? 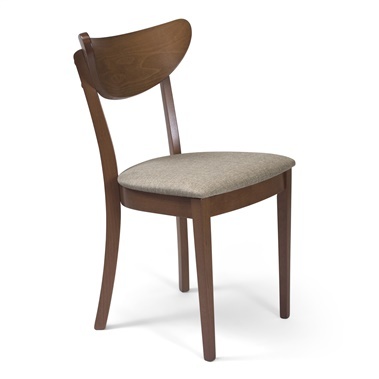 The pricing for the Halldis Side Chair is for each chair, but this item must be sold in increments of 2, as this is how the manufacturer packages the chairs for shipment. Hello, How much weight can these chairs support? The Halldis Side Chair are rated for use up to 250 lbs. What do the other colors offered look like? There aren't any exmaples. We will be happy to send swatches of the other finishes options to you in the mail, free of charge. To request swatches, you may email us at [email protected] with the colors you would like to see, along with your mailing address. The Halldis Side Chairs are not stackable.